A potent mix of elements from Bonnie And Clyde (1967) and The Untouchables (1987), Public Enemies never quite reaches the same heights as classic crime movie dramas, but is nevertheless an often compelling yarn about charismatic bad guys, their dames, and the g-men out to get them. Public Enemies is based on the true story of notorious criminal John Dillinger, who was designated public enemy number one in the 1930s for a string of daring Depression-era bank robberies and prison escapes. A media darling and something of a folk hero for treating customers with respect as he held up the bank managers, Dillinger (Johnny Depp) falls in love with Billie Frechette (Marion Cotillard) without slowing down his often violent crime spree. Under the growing influence of a young J. Edgar Hoover (Billy Crudup), an FBI task force led by Melvin Purvis (Christian Bale) is created to track down Dillinger and his associates. Dillinger repeatedly embarrasses the police and the FBI by slipping through their fingers before he is eventually betrayed, cornered and killed outside a Chicago movie theatre. Director Michael Mann puts the hefty 140 minutes of running time to good use and finds a reasonably satisfying balance between intense action sequences, including prison escapes, bank robberies, and hideaway shoot-outs, and the development of the three main characters. Depp succeeds in giving Dillinger some soul, Bale provides Purvis with grim determination, and Cotillard captures the wide-eyed attraction of women who have nothing to criminals who offer a life of unimaginable adventure. Public Enemies would have benefited from a purposeful trimming of the supporting cast. The film occasionally stumbles when numerous secondary characters get in the way. Many Dillinger associates clutter the screen and are given little time to breathe (often literally). Criminals Baby Face Nelson, Tommy Carroll, Red Hamilton, Pretty Boy Floyd, Ed Shouse, Pete Pierpont, Charles Makley and Alvin Karpis are just some of the fellow gangsters who make an appearance in the character-heavy script (co-written by Mann), but they do little except snarl and fire their weapons. On the other side of the law, another half dozen agents form Bale's posse, and they generally just appear earnest and follow instructions. The cinematography, costume design and set design succeed in bringing to life a vibrant 1930s setting grand enough to absorb the unfolding larger than life drama, but with more emphasis on glitz and glamour than depression. 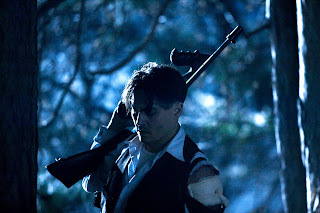 Public Enemies has epic ambitions, and while the human focus is spread too thin and works only when attention is maintained on the main characters, the action-oriented scenes live up to expectations, exuberantly spraying thrills from the barrels of smoking Tommy guns.